TEACH MUSIC THEORY THE FUN WAY! 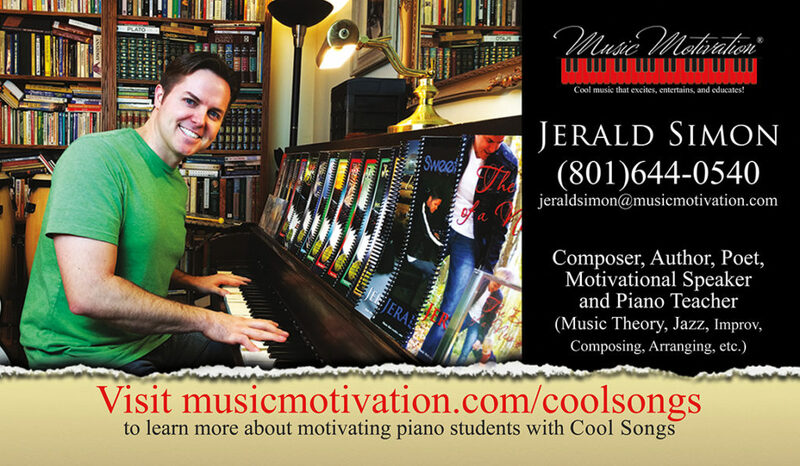 Jerald Simon created his company, Music Motivation®, to motivate music students of all ages with “Cool music that excites, entertains, and educates”. The three main areas of focus for Music Motivation® are Theory Therapy, Innovative Improvisation, and Creative Composition. One of Jerald’s primary goals at Music Motivation® is to help prepare the next generation of composers, arrangers, musicians, music teachers, and musicologists to use their music and their love of music to make a difference in their own lives, their community, and the world. Primarily focused on teaching teenagers – ages 12 and up, and adults. Learn intervals, chords, scales, etc., and how to use them. Jerald puts the FUN into theory fundamentals. Change any style/key signature, etc. Learn to arrange music and play the same piece 100 different ways! Learn to compose music of your own. Learn how to create a melody, add harmony, and publish your own music! Learn to do your very best in everything! Become the best you, you can be! Become one of my piano students! I teach piano students ages 12 and up and adults. My music lessons are perfect for jazz band piano students, college students going into music, and piano teachers and music educators who want to learn music theory, how to improvise and arrange music in all styles and key signatures, and how to compose music of their own. I focus on a specific music niche – primarily gearing my piano lessons for teenagers (especially teenage boys – although I do teach several teenage girls as well), and adults – especially those in the music profession and music students at the university/college level who want to go into music for a career. Most of my students are wanting to take their music to the next level by learning to improvise and compose music of their own in addition to learning how to play jazz, blues, pop, rock, new age, and show tune/broadway music. I teach and show students how to learn music theory – the FUN way through original Cool Songs I have composed. 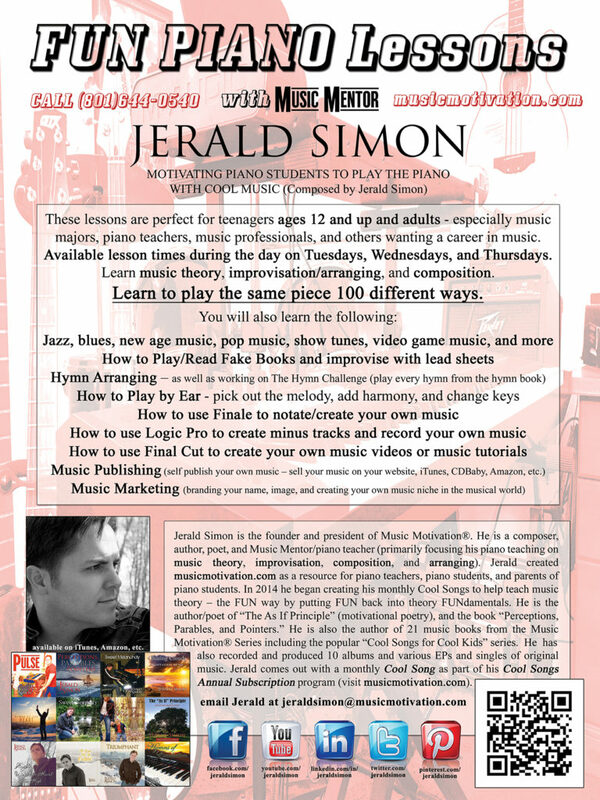 I also teach my students how to use Finale (a music notation software program) so they can put their own compositions down on paper, how to use Logic Pro (a DAW – digital audio workstation to add other instruments to their compositions), how to self publish the music they compose, and how to record and distribute/sell their own music through online music stores such as iTunes, CDBaby, Amazon, and all other online music stores. I also teach several piano teachers in each of these areas as well. Because I have many students and a waiting list, I recommend getting your name on my waiting list as early as possible. Many piano students begin with other teachers and take from me when they are a little older and a little more advanced. My youngest starting age for students I teach is 12. If you have a student under the age of 12, I can get them on my waiting list and will let you know as soon as spots are available. I have taught as young as 3 before and as old as 93. I have found that I love teaching piano students of all ages, but where I excel the best and who relates best to me, are teenagers and adults. Call me at (801)444-5143 to sign up for piano lessons or to have your name put on my waiting list. Send me a message if you are interested in piano lessons (one on one piano lessons at my studio in Utah, or piano lessons via Skype or FaceTime (my preferred form of teaching online lessons) – It doesn’t matter where you live, you can be anywhere in the world). 90 min. – 2 hour lessons for specific training on composition, orchestration, music production, and marketing (I do have some professionals who request more time as needed). I offer one on one piano lessons (in person – or via FaceTime or Skype), I give group piano lessons (for adults and piano teachers) on request, generally at a music store or central location for the group members, and will soon be offering online piano lessons where piano students sign up for a monthly piano lesson plan and are given access to stream pre-recorded piano video lessons at their home in addition to one personal lesson via FaceTime or Skype). I also offer a Crash Course in Composition training which includes 1 hour of one on one instruction (either in person or via FaceTime or SKYPE) helping students compose and notate music of their own. With this optional focus on composing, music students learn composition ideas as well as receive personal advice on composing/notating, and marketing music of their own. Piano students (and piano teachers) can click here to sign up for my Cool Songs Packages. Depending on your package choice, you will also be able to download all of my books as PDF downloads (currently over 200 piano pieces between the 21 books I have come out with to date) in addition to receiving 86+ Cool Songs. 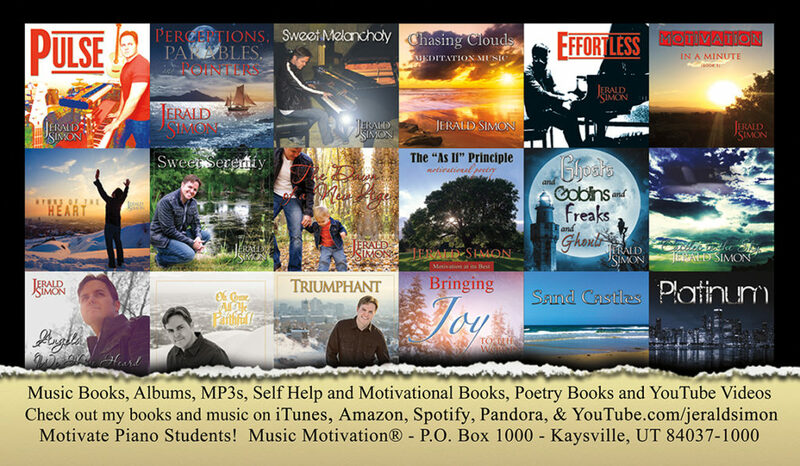 There is an annual $20.00 enrollment fee, and all students must also purchase the following two physical books at their first lesson (1) The Music Motivation Goal Book ($14.95), and (2) Essential Piano Exercises ($25.95). Depending on where the students are they can purchase other level appropriate books featuring Cool Songs I have composed to teach music theory the FUN way. If students would like to, they can also purchase my motivational/self help books as well (“The ‘As If’ Principle” – 222 motivational poems I have written, “Perceptions, Parables, and Pointers”, “Who Are You? Getting to know yourself, your strengths, weaknesses, goals, dreams, hopes, fears, and potential!” (a Personal Improvement workbook on setting goals and accomplishing more). These are all monthly tuitions. The price does not change depending on months or weeks in the month. If there is a fifth week (e.g. if lessons were on Wednesday and there were five Wednesdays during the month) there are no lessons on that fifth week. If you come to piano lessons each week and walk away from your lessons and only learn about music notation, rhythm, and dots on a page, then I have failed as a Music Mentor. Life lessons are just as important, if not more important, than music lessons. I would rather have you learn more about goal setting and achieving, character, dedication, and personal improvement. To have you learn to love music, appreciate it, and play it, is a wonderful byproduct you will have for the rest of your life – a talent that will enrich your life and the lives of others. To become a better musician is wonderful and important, but to become a better person is more important. 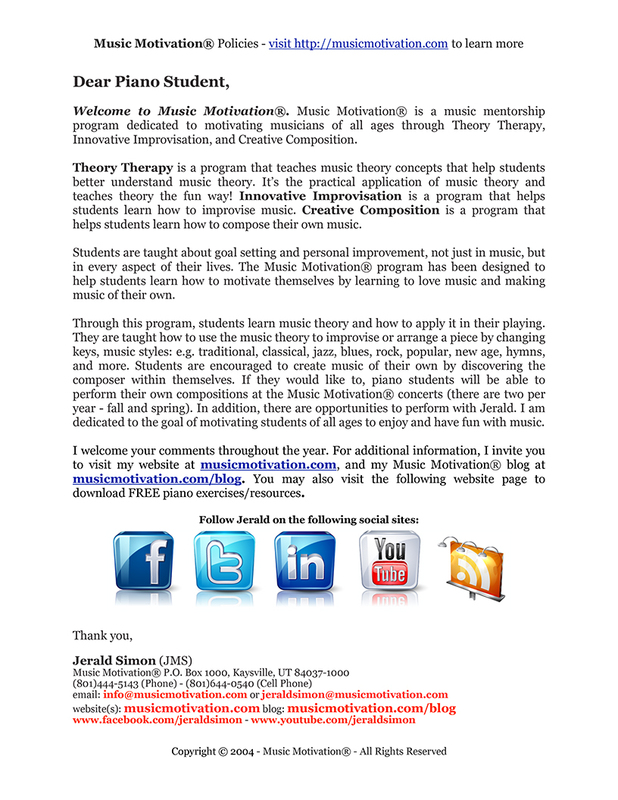 As a Music Mentor I want to mentor students to be the very best they can be. If you choose not to practice, you essentially choose not to improve. This is true in any area of life. Everyone has the same amount of time allotted to them. What you choose to do with your time, and where you spend your time, has little to do with the activities being done and more to do with the value attached to each activity. I believe it’s important to be well-rounded and have many diverse interests. I want students to enjoy music, to learn to be creative and understand how to express themselves musically – either by creating music of their own, or interpreting the music of others – by arranging and improvising well known music. In addition, I encourage students to play sports, dance, sing, draw, read, and develop their talents. I want them to be more than musicians, I want them to learn to become well-rounded complete individuals. Above all, I want everyone to continually improve and do their best no matter what they do or choose to do. I encourage everyone to set goals, dream big, and be the best they can be in whatever they choose to do. Life is full of wonderful choices. Choose the best out of life and learn as much as you can from everyone – everywhere. I prefer being called a Music Mentor because I want to mentor others and help them to live their dreams. Your life is your musical symphony. Make it a masterpiece! Watch these videos and get to know me (Jerald) a little better! Sign up for piano lessons or get on my waiting list! I’d love to hear what you are doing with your music and what your music goals are. Send me a message!